(and it should be noted Feroz-bhai is nearly equal opportunity when it comes to display of flesh, so, um, thanks for that studded codpiece, FK) - complete with synthesizers, ululating, and a guy in a gorilla suit - are the least of my concerns. I'll put it this way: Janbaaz makes Yalgaar look good. The red flags are many, so I'm going to pick one out as an example. 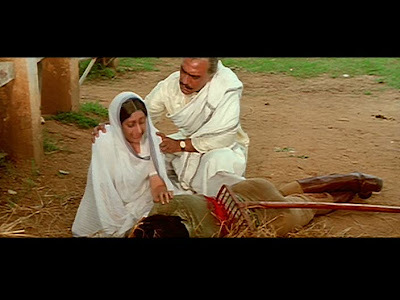 After a literal roll in the hay (and an intercut scene of splashing drops of white liquid) (seriously), Dimple tells Anil she wants to get married. He hems and haws and then later flat-out refuses, denying any commitment. She starts off moping but quickly talks herself into a plan: "The same helpless Indian woman.... It's a woman's fate to put up with every atrocity of man. No...I'm going to change my destiny. I'm a woman of today! And I won't endure any atrocity of his! If Amar is toying with my heart, I can toy with his emotions. And better than him!" Modern Indian women don't simper - they manipulate other people in a game of jealousy! 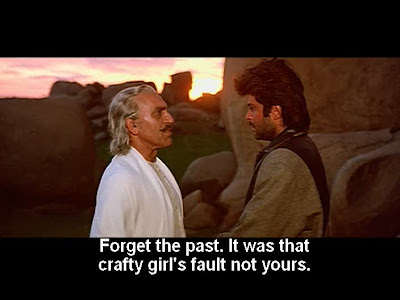 And when said game goes horribly wrong, thanks to Anil's violent temper and perma-drunking, both perpetrator and his corrupt father (Amrish Puri) blame her - because in addition to being female, she was an illegitimate child, dontcha know. "I knew her tainted blood would someday besmirch the fabric of our honor," wails the father who earlier patted his son on the back for playing Russian roulette, doing drugs, sleeping around, and getting arrested. And as big reconciliation looms, she herself even takes on the blame. No, movie. No. The drunk spoiled boy who lives in a consequence-free world is responsible for his actions. She did stir up a situation (and entangle an innocent and sympathetic Dalip Tahil in the process), but its escalation is entirely his fault. Ugh. Like the world needs more of this. Arti Gupta, last seen on BLB in Purana Mandir! 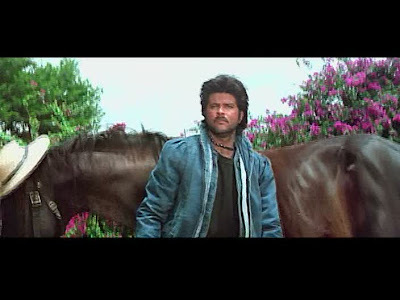 Please also note Anil's puff-shouldered jean jacket. 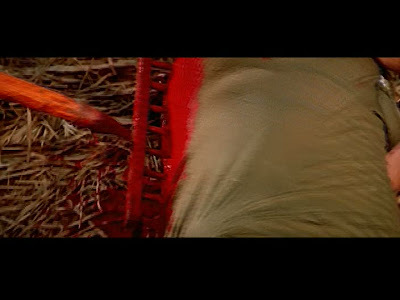 and a corpse who is killed when a rake impales his back parallel to his spine but curiously ends up with the rake perpendicular to his spine a scene later. Not only can the rake kill, it can move! Look out! It's such a mess. A violent, distasteful, punishing (to the viewer) mess. Avoid, yaar. Sorry, FK. 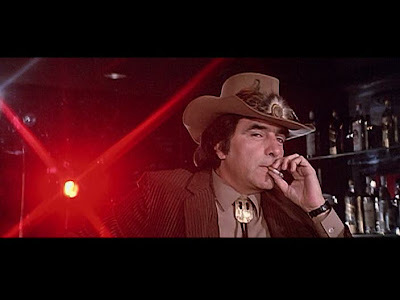 I'm beginning to think I should stay away from your films made after Qurbani, and sadly that only leaves me with Dharmatma left to see. 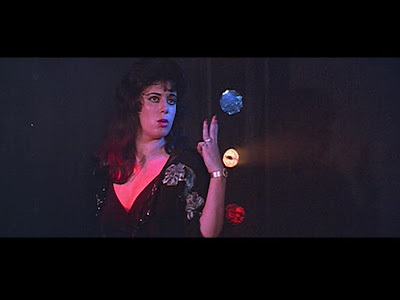 Aside 1: it's the neon orange square/mirrored disco background seen in Sawaal and Kalyug! 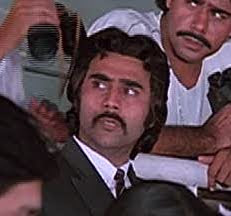 Aside 2: in this film, but not others, Puneet Issar reminded me so much of Greg "Mr. Willoughby" Wise! NAHIIIEEEE!!! Beth tumne kya kiya/What did you do! I have my upset review at the masala pradesh, check it out, lol janbaaz almost makes yalgaar look good but I would rather a asshat anil than a dopey Vicky or even doped-up Sanju! 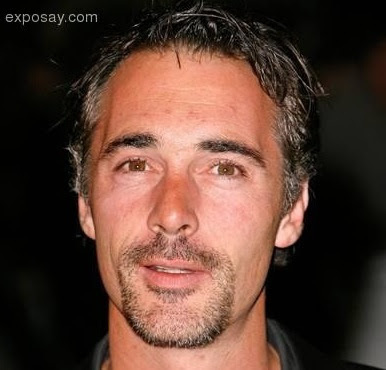 But lol there are soo many members of the moustache club here that I've outlined in my review! Lol i loved how Raza Murad had to a sort of grapevine-side step move whenever he walked! This movie is hilarity on ACID! Have you seen Kabeela? Cause Todd liked it (pre-80s Feroz) and I have it, and would love to watch it with you. AHAHAHAH!!! So sorry it scarred your retina, Beth! But this movie is like crack to me. It's so terrible and yet it's so entertaining. It's a movie written and made while everybody was on an acid trip. So it has all the horrible things from the 80s just made even more fucked up. Sunny - Is it? I didn't enjoy the music at all. Rum - I KNOW. I was so foolish! I wish I had remembered your post from so long ago! Gah. Awful. Agree re: Raza Murad's walk - SOOOO gimpy. memsaab - AVOID YAAR AVOIIIIIIIID. :) I haven't seen Kabeela but will try to hunt it down. Amrita - The movieeee, it hurtz my braaaaain! 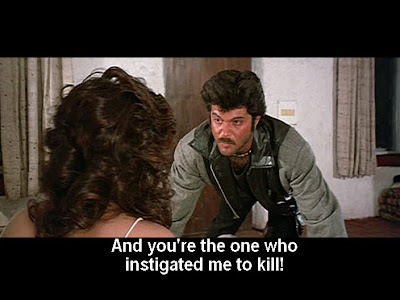 I was trying to explain to Memsaab what exactly was so awful about it and I had to come back to the story and dialogues (HORRIBLE INNUENDO ALERT! WHOOOOP WHOOOOP!) as the baseline. The trappings were trash, but the real rot is what was going on and why. I do, however, like your checklist, and if Pitu Sultan goes ahead with her 80s cheese weekend in 2010 I shall need a much longer checklist to help me navigate its perils. Also, "check and WORSE" is an excellent concept and I promise you will see it on this site again soon. Pitu - Do you!!! The Shashizens are SHOCKED. That's a very interesting theory! I don't think I've seen any Feroz bald - though I recall the look of course - but how can a person not like the Feroz of Qurbani?!?! Tell Aspi that 2000s cheese is NOT on the menu. Feroz in 'Janasheen' is bald, also in 'Welcome'. I think as long as there's SOME floozy in a bikini, Aspi'll be ok with it haha!